How much more US hostility toward Russia will it tolerate before declaring unacceptable red lines were crossed? Washington and Moscow are on opposite sides of endless war in Syria – a US imperial project from day one of hostilities. According to neocon Russophobe Nikki Haley and US ambassador to Moscow Jon Huntsman, further (illegal) Trump administration sanctions on Russia are coming, likely Monday. According to Haley, Russian enterprises allegedly “dealing with equipment related to Assad and any chemical weapons use” will be targeted. The Big Lie persists. No evidence supports it. Facts on the ground never deter Washington from pursuing it diabolical imperial agenda. US administrations and bipartisan congressional members consistently blame sovereign independent nations for US high crimes committed against them. 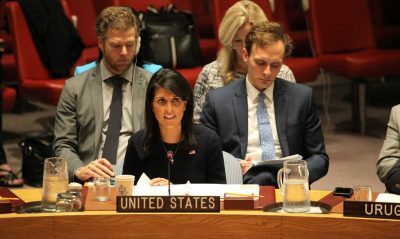 Haley falsely accused Moscow of aggressive behavior, turning truth on its head, claiming the Kremlin facilitated the alleged Douma CW incident. Medical personnel on the ground treated no one for toxic poisoning, no one killed, ill or harmed, no CW residues found by Russian technical experts at the alleged site. The false flag incident was staged to blame Syria and Russia for a nonevent – the Big Lie used as a pretext for US-led terror-bombing of Syrian sites, followed by more illegal sanctions on Moscow coming Monday. On Sunday, OPCW inspectors arrived in Douma to inspect the site of the alleged CW attack, according to Syria’s Deputy Foreign Minister Ayman Soussan. AMN news said following US-led terror-bombing of Syrian sites, Russia is sending government forces more weapons and heavy equipment. According to Southfront, the Pentagon lied, claiming all missiles fired struck Syrian targets – at the same time expressing concern about mission results. An internal probe will be conducted to produce a more accurate after-action report, including why Syrian air defense systems downed most incoming missiles – reportedly 71 of 103 fired. Security Council debates omit discussing this key issue. Along with terrorists permanent SC members America, Britain and France support, Damascus faces “three aggressors:” Washington, London and Paris. After the latest US-led aggressive incident on a sovereign state, what’s next? Addressing the issue diplomatically assures continued failure, along with weakness, encouraging Washington to slam Russia and Syria harder. Dealing with hegemonic America requires using the only language it understands – challenging it forcefully. Pursuing failed policies assures making a bad situation worse ahead. Washington isn’t likely to step back from the brink unless pushed. Diplomacy is futile, accomplishing nothing, encouraging greater US hostility, including endless aggression in Syria and tough anti-Russia actions. Washington’s rage for global dominance likely assures an eventual East/West showdown. Responding weakly to hostile US actions assures more to come, likely harsher than already. When will Russia respond with toughness – better to risk it in Syria than be forced to act in defending its heartland.